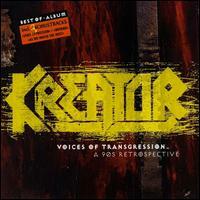 Kreator's previous collection, Scenarios of Violence, had been a fairly week offering released through Noise Records, involving some remixed and live material and a few unreleased studio cuts, but Voices of Transgression, through G.U.N. Records, is at best an asinine cash grab that should be melted into slag. I mean, who in their right mind would come up with the idea to try and capitalize on some of a band's least successful material? This was actually released prior to Endorama, and yet almost the entire track-list consists of material from that album and the previous three. Compilations can occasionally be worth their time when they assemble demos, rare recordings, and even covers and live material, but this is nothing more than a sampler from recent studio albums with a couple bonus carrots at the end of the stick. A half-rotten carrot. If you despised the 90s Kreator, from Renewal through Endorama, then obviously you won't even blink an eye as you skip this recording, but for those who accepted the band's migration through various climates, there are a couple of bones being thrown. The first is a techno metal cover of the Sisters of Mercy's "Lucretia" with Mille serving both his trademark barks and a deeper clean not unlike Tiamat's Johan Edlund. It's not bad at all, if you're into this sort of thing, and further affirms the direction the band had taken with Endorama. "As We Watch the West" is another melodic piece which feels like it could have just been placed on that album, but despite the glistening atmosphere and subdued samples, I thought it was fairly forgettable, possibly best heard by those that like Pink Floyd influenced Gothic/doom metal bands like Tiamat (again) or Lake of Tears. "Inferno" is considerably heavier, with Mille's vocals taking control again, and this is perhaps the most valuable of the three, but it's not great. The cover of Raw Power's "State Oppression" is not news, it was released as a bonus track on the Cause for Conflict CD. Aside from this, though, and an edit of "Isolation", the remainder of the content here is just lifted from the band's past and future albums. "Chosen Few", "Golden Age" and "Endorama" were from the forthcoming Endorama; "Leave This World Behind", "Phobia", "Black Sunrise" and "Whatever It May Take" from the previous Outcast, from which the paint had still yet to dry; Renewal is represented only with "Renewal" itself; and Cause for Conflict has "Bomb Threat", "Lost" and "Hate Inside Your Head". It's not a heinous selection, and it represents the band's 90s maneuvers well enough, but it's just a waste of coin. The entire effort reeks of something that is needed to fill out a record contract. It'd be far better for Kreator to just have found some way to include the Sisters of Mercy cover, "Inferno" and "As We Watch the West" with the CD release of Endorama, where they might have offered some value. A '90s retrospective' was not needed, as the 90s were not yet out of session. Avoid this at all costs, or just YouTube the unreleased tracks.